Like most right thinking people, David Lynch is one of my heroes. Twin Peaks is one of my favourite TV experiences, an immersive world with its own codes. In it there is a mad killer called Bob, who drives a much of the narrative, and he came about by sheer accident. The actor Eric Silva was working as a set dresser, here’s what Lynch says about it in ‘Catching the big fish’, an excellent book by the way. “Frank was never destined to be in Twin Peaks, never in a million years. 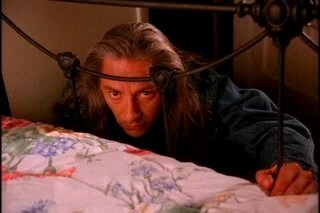 But we were shooting in Laura Palmer’s home and Frank was moving some furniture around in her room. I was in the hall, underneath a fan. And a woman said, “Frank, don’t move that dresser in front of the door like that. Don’t lock yourself in the room. We did a pan shot of the room, twice without Frank and then one time with Frank frozen at the base of the bed. But I didn’t know what it was for or what it meant. So things like this make you start dreaming. And one thing leads to another, and if you let it, a whole other thing opens up. Anyway it came to me in a flash that my recent ‘howler’ could be a blessing in disguise. There is some talk about refraction and things not seeming to be where they should be in Defenders of Guernsey. And my ‘mistake’ described a mirror image channel islands, where things that should have been east were actually west and so on. A perfect explanation for this has opened up in my mind for the second story. Suddenly that howler looks more like a stroke of luck. This entry was posted in Uncategorized and tagged Bob, Catching the big fish, David Lynch, Defenders of Guernsey, Twin Peaks. Bookmark the permalink. THAT scene with Bob at the food of the bed gave be nightmares for months after I saw it… still makes me shudder. Yes Bob is terrifying. The underrated movie Fire Walk With Me, which was a prequel to Twin Peaks features Bob too, and he is probably even more appalling. Lynch can put the willies up you so well.